Every Labor Day weekend, it’s the same: The Muscular Dystrophy Association (MDA) hosts its annual telethon to raise awareness of and funds for neuromuscular disease. This year, the multi-hour television broadcast, which airs Sunday, Sept. 4 on CW17, includes celebrities such as Celine Dion, Jennifer Lopez, Lady Antebellum, Richie Sambora and Jordan Sparks, who will perform, answer phones and receive gigantic, novelty-sized checks. In the middle of it all, we’ll hear Aaron Bates, a 31 year old attorney from Orlando. Why is this important? Because Bates is a Mayo Clinic patient and one of only a handful of MDA patients selected to appear on the telethon. 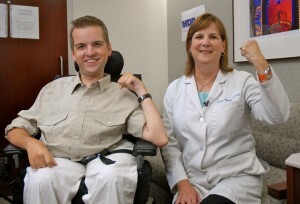 Born with a form of muscular dystrophy called spinal muscular atrophy, Aaron first came to Mayo Clinic in 2000 where he was seen by neurologist Kathleen Kennelly, M.D. “I couldn’t choose a better place to be treated,” he says of “the top tier facility,” which is recognized as one of a few Muscular Dystrophy Association clinics in the state. Thanks to the efforts of Dr. Kennelly and the rest of the Mayo staff, Bates has been able to live an active life, unlike many affected by muscular disorders. Among his accomplishments, being an advocate for those with disabilities, including serving on the MDA’s national task force for public awareness. Closer to home, Bates, whose younger sister is affected by SMA, has also been instrumental in legislation vital to the rights of disabled people in the state of Florida. Obtaining his law degree in less time than some take to complete their undergraduate education, Aaron became one of the youngest graduates ever from Florida State University’s School of Law. Job offers rolled in. Except before the ink had dried on his diploma, Aaron lost government funding for his personal care attendant, an individual employed to assist him with many of his essential daily tasks. At the time, state law mandated that funding for the attendant cease upon completion of law school. “The system in place was ludicrous. I had multiple job offers but was unable to accept them because I could no longer afford an attendant,” Bates recalls. Aaron didn’t have a job, but he did get to work. Aaron fought for his own livelihood as well as for the rights of the disabled in his home state. Finally, after an exhausting three year battle, The Florida Personal Care Attendant Program was born. The law awards funding for the employment of a personal care attendant to those disabled individuals who’ve achieved and maintained employment in the state of Florida. With the new legislation in place, Aaron hung out his shingle in Orlando with a friend. The law firm of Bates Mokwa PLLC handles general litigation and specializes in commercial and personal injury cases. “He’s truly an amazing young man,” says Dr. Kennelly of his advocacy work. She is proud to have him as a patient and believes his efforts have – and will continue to – help a lot of other people. Bates continues to step up to the plate and his passion is part of what garnered the attention of the national MDA. In late September, Bates will travel to Washington, DC to represent the organization at a national summit, which he hopes will help stimulate change on a grander scale, just as it did in Florida. In the meantime, tune in on Sunday, Sept. 4, somewhere between Lady Antebellum and Darius Rucker performances, and listen firsthand to this Mayo Clinic patient will tell his story, hoping to spur change. Certainly, many viewers will change the channel. But Aaron’s hope is that some will listen. And some will even send checks. And when it’s over, Aaron Bates will continue to work and advocate. It’s what he’s always done.